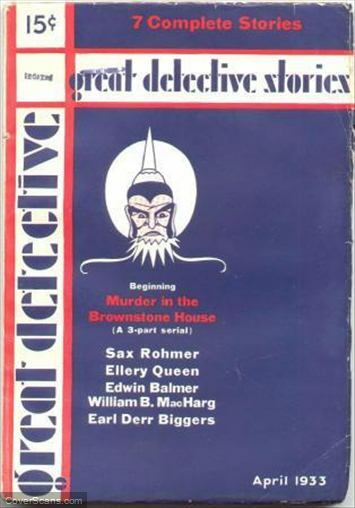 Frederic Dannay and Manfred Lee’s first published short story appeared in the second issue of Great Detective Magazine in April 1933. This story stands out not just for its length, but also since absolutely nobody died in its pages. Yes, indeed, this was the first opus of Ellery Queen’s corpseless corpus. This straightforward tale concerns the theft of several copies of the book Europe in Chaos from people who purchased the book from a small Manhattan bookstore, as well as the theft of a rare one-penny black postage stamp from a nearby stamp gallery, and a missing stamp collection assistant. Ellery enters the story and, without even a “Challenge to the Reader,” solves the mystery. There are a couple of mysteries, perhaps unintended, to this story. First, who would have guessed that Europe in Chaos was such a popular book that seven copies would leave one obscure, out-of-the-way Manhattan bookstore in a matter of days? Such a book, in a way, does exist, only with a slightly changed title: The Chaos in Europe: A Consideration of the Political Destruction that has Taken Place in Russia and Elsewhere and the International Policies of America, was written by Frederick Moore in 1919, and can be read here. Second, what sort of world exists where obsessive stamp collectors can hire assistants whose sole job is to organize the boss’ stamp collection? What sort of person aspires to be a stamp collection organizer? And, can that sort of person be trusted? Of course, private collectors do have their private curators, but some would say there is a difference between caring for works of the Masters and caring for small pieces of mass produced gummed paper. Obsessions are obsessions, after all, and here we all are with Ellery Queen.